The difference between the Parthenon and the World Trade Center, between a French wine glass and a German beer mug, between Bach and John Philip Sousa, between Sophocles and Shakespeare, between a bicycle and a horse, though explicable by historical moment, necessity, and destiny, is before all else a difference of imagination. Modernism spawned the greatest explosion of art, architecture, literature, painting, music, and dance of any era since the Renaissance. In its long unfolding, from Yeats, Pound and Eliot to Picasso and Matisse, from Diaghilev and Balanchine to Cunningham and Stravinsky and Cage, the work of Modernism has provided the cultural vocabulary of our time. One of the last pure Modernists, Guy Davenport was perhaps the finest stylist and most protean craftsman of his generation. Publishing more than two dozen books of fiction, essays, poetry and translations over a career of more than forty years, he was awarded a MacArthur Fellowship in 1990. 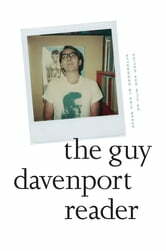 In poetry and prose, Davenport drew upon the most archaic and the most modern of influences to create what he called assemblages”-lush experiments that often defy classification. Woven throughout is a radical and coherent philosophy of desire, design and human happiness. But never before has Davenport’s fiction, nonfiction, poetry and translations been collected together in one compendium. Eight years after his death, The Guy Davenport Reader offers the first true introduction to the far-ranging work of this neglected genius.